Netsuite offers a variety of products, featuring their flagship CRM / ERP solution. Netsuite also offers an eCommerce solution called SuiteCommerce, but most find it disadvantageous for many reasons including the lack of available customizations, the SEO roadblocks, and more. Clarity eCommerce offers a better way. With market leading functionality for businesses that are serious about selling online, Clarity has delivered THE solution for mid to large-sized eCommerce store. This NetSuite eCommerce combination is the most flexible B2B Enterprise eCommerce solution you can find. Performance on the backend and frontend of Clarity eCommerce has been a priority for us from Day 1. We know that for great administration a site and its systems need to be fast, and for a great user experience the storefront needs to be fast as well. This all comes with Ajax functionality which makes management and browsing really flexible. AngularJS, Elastic and other technologies allow our platform to handle many millions of SKUs in a single store. With responsive development, you can view, buy, manage, change, and more all from any type of device. Based on the popularity of mobile purchasing and the increased need to manage on the fly, this functionality has been core to our development philosophies for the entirety of our development cycles. 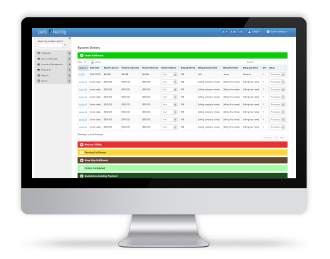 Clarity has also released two mobile apps for administrators with warehouse management, and remote orders processing. You may need to be able to sell internationally, and that requires many additional functionalities including tax & shipping calculation, currency conversion, and more. Clarity eCommerce offers all of this with easy configuration to set the different countries you need to sell in. Whether it's a partnership, channel sales, or otherwise, you may need to offer stores within your eCommerce store (hosted on your site). This can be very beneficial for you, the website property owner, and the partner you're allowing to set up shop. Clarity eCommerce makes it easy to add these additional stores. Clarity eCommerce allows all types of companies to be successful selling online, including B2B, B2C, enterprise, distributors, and more. There is dedicated functionality for each, which makes Clarity eCommerce the most specialized platform on the market (while still satisfying all of your needs). Better Options, Features, and Functionality! Clarity eCommerce was built in accordance with many demanding and modern specifications-features, as we knew we wanted to build the most sophisticated and advanced enterprise eCommerce platform on the market. This includes an up-to-date .NET Framework 4. Of course, a good SuiteCommerce alternative needs to integrate seamlessly with all of Netsuite's business applications. Via Clarity Connector, a NetSuite eCommerce Integration solution provides best in class features, scalability and best of all, price! Most if not all of Clarity's success can be attributed to the level of talent that we bring on year in and year out. When you work with Clarity to improve your company's web systems, you can feel rest assured that you are in the hands of industry experts and some of the most capable individuals in the industry. To learn more, please visit the NetSuite eCommerce Integration Resource Center.